The Senate Judiciary Committee has posted Federal Circuit nominee Kathleen O’Malley’s answers to its written questions. You may recall that she appeared before the committee to answer questions back on July 28, 2010. If memory serves me correctly, the Senate Judiciary Committee asked no questions relating to patents during the in-person appearance or in the questions for the record. Judge O’Malley’s written answers to the Senate Judicary Committee’s questions are available here: [Read]. Advocates at the Federal Circuit sometimes (although rarely) use poetry during oral argument. In Figueroa v. U.S., 466 F.3d 1023 (Fed. Cir. 2006), a case from 2006 concerning the constitutionality of patent fees, one of the attorneys used verse from Alice in Wonderland plus his own original composition: [Listen]. It has been almost four years since the Federal Circuit declined to take en banc review of the case Amgen, Inc. v. Hoechst Marion Roussel that would have allowed the court to review its en banc ruling in Cybor Corp v. FAS Techs., Inc., 138 F.3d 1448 (Fed. Cir. 1998). In declining to hear the Amgen case en banc, several of the judges noted that when the right case came along, they would be willing to grant en banc review to reconsider Cybor. [Read]. Judge Clevenger and Judge Moore recently made these comments which seemed to imply discontent with the Cybor precedent during the oral argument of Lincoln National Life Insurance Co. v. Transamerica Life Insurance Co., 2009-1403 (Fed. Cir. June 23, 2010): [Listen]. Judge Moore also made a comment about revisiting Cybor back in 2009 during the oral argument of Kara Technology, Inc. v. Stamps.com, Inc. [Listen]. And, you might recall that the court can take en banc review sua sponte. They did so in Abbott Labs v. Sandoz, Inc., 566 F.3d 1282 (Fed. Cir. 2009) on the limited issue of product-by-process claims, for example. One wonders if the time is now ripe and whether the vacancies on the court favor granting en banc review of Cybor. The Cybor decision is available here: [Read]. Section 271(a) defines infringing conduct: “whoever without authority makes, uses, offers to sell, or sells any patented invention, within the United States. . . infringes the patent.” 35 U.S.C. § 271(a). An offer to sell is a distinct act of infringement separate from an actual sale. An offer to sell differs from a sale in that an offer to sell need not be accepted to constitute an act of infringement. See MEMC Elec. Materials, Inc. v. Mitsubishi Materials Silicon Corp., 420 F.3d 1369, 1376 (Fed. Cir. 2005). Moreover, the damages that would flow from an unac-cepted offer to sell and an actual sale would likely be quite different. See Timothy R. Holbrook, Liability for the “Threat of Sale”: Assessing Patent Infringement for Offer-ing to Sell an Invention and Implications for the On-Sale Patentability Bar and other Forms of Infringement, 43 Santa Clara L. Rev. 751, 791-92 (2003). We analyze an offer to sell under § 271(a) using traditional contract principles. Rotec Indus., Inc. v. Mitsubishi Corp., 215 F.3d 1246 (Fed. Cir. 2000). There is no dispute that there was an offer to sell in this case, but Maersk USA argues that the offer was made in Norway, not the United States, thereby absolving it of § 271(a) liability. Maersk A/S (a Danish company) and Statoil ASA (a Norwegian company) negotiated the contract that is the subject of this alleged offer to sell. Their U.S. affiliates, Maersk USA and Statoil executed the contract in Norway. The contract included an “Operating Area” of the U.S. Gulf of Mexico. The district court held that because the negotiations and execution took place outside the U.S., this could not be an offer to sell within the United States under § 271(a). Transocean argues that to hold that this contract be-tween two U.S. companies for performance in the U.S. is not an offer to sell within the U.S. simply because the contract was negotiated and executed abroad would be inconsistent with Lightcubes, LLC v. Northern Light Products, Inc., 523 F.3d 1353 (Fed. Cir. 2008) (holding that a foreign company cannot avoid liability for a sale by delivering the product outside the U.S. to a U.S. customer for importation). Transocean argues that a contract between two U.S. companies for delivery or performance in the U.S. must be an offer to sell within the United States under § 271(a). Maersk USA argues that Rotec, 215 F.3d 1246 and MEMC, 420 F.3d 1369 require that, for there to be an offer to sell within the U.S., the offer activities must occur within the U.S. It argues that the negotiations and execution outside the U.S. preclude offer to sell liability in this case. This case presents the question whether an offer which is made in Norway by a U.S. company to a U.S. company to sell a product within the U.S., for delivery and use within the U.S. constitutes an offer to sell within the U.S. under § 271(a). We conclude that it does. Sec-tion 271(a) states that “whoever . . . offers to sell . . . within the United States any patented invention . . . infringes.” In order for an offer to sell to constitute in-fringement, the offer must be to sell a patented invention within the United States. The focus should not be on the location of the offer, but rather the location of the future sale that would occur pursuant to the offer. The offer to sell liability was added to the patent stat-ute to conform to the April 1994 Uruguay Round’s Trade-Related Aspects of Intellectual Property Agreement (TRIPS). The underlying purpose of holding someone who offers to sell liable for infringement is to prevent “generat-ing interest in a potential infringing product to the com-mercial detriment of the rightful patentee.” 3D Sys., Inc. v. Aarotech Labs., Inc., 160 F.3d 1373, 1379 (Fed. Cir. 1998). The offer must be for a potentially infringing article. Id. We are mindful of the presumption against extraterritoriality. Microsoft Corp. v. AT&T Corp., 550 U.S. 437, 441 (2007). “It is the general rule under United States patent law that no infringement occurs when a patented product is made and sold in another country.” Id. This presumption has guided other courts to conclude that the contemplated sale would occur within the United States in order for an offer to sell to constitute infringe-ment. See, e.g., Semiconductor Energy Lab. Co. v. Chi Mei Optoelectronics Corp., 531 F. Supp. 2d 1084, 1110-11 (N.D. Cal. 2007). We agree that the location of the con-templated sale controls whether there is an offer to sell within the United States. The statute precludes “offers to sell . . . within the United States.” To adopt Maersk USA’s position would have us read the statute as “offers made within the United States to sell” or “offers made within the United States to sell within the United States.” First, this is not the statutory language. Second, this interpretation would exalt form over substance by allowing a U.S. company to travel abroad to make offers to sell back into the U.S. without any liability for infringement. See 3D Sys., 160 F.3d at 1379. This company would generate interest in its product in the U.S. to the detriment of the U.S. patent owner, the type of harm that offer to sell within the U.S. liability is meant to remedy. Id. These acts create a real harm in the U.S. to a U.S. patentee. Neither Rotec nor MEMC preclude our determination that an offer by a U.S. company to sell a patented inven-tion to another U.S. company for delivery and use in the U.S. constitutes an offer to sell within the U.S. First, SEB S.A. v. Montgomery Ward & Co., 594 F.3d 1360, 1375 (Fed. Cir. 2010) contemplated whether the territorial reach of the offer to sell language had been decided by Rotec and concluded that it had not. The defendants in Rotec did argue that because the offer was made in China, not the U.S., they did not infringe. Rotec, 215 F.3d at 1251. And the Rotec court discussed the evidence regard-ing meetings and communications made in the United States. Id. at 1255. The Rotec court held that there was no offer to sell, not because of the location of the offer or of the ultimate sale, but rather because there was no evi-dence that an offer was communicated or conveyed by the defendants. Id. at 1255 (“None of this evidence, however, establishes any communication by Defendants with any third party.”). In concurrence, Judge Newman indicates that she would have instead decided the case on the ground that there was no offer which contemplated a sale within the U.S. Id. at 1259 (Newman, J., concurring). The MEMC case is even further attenuated as it did not even consider location of the offer or the contemplated sale, but instead held there was no offer to sell because the emails at issue, which contained only technical data and no price terms, cannot constitute an offer that could be made into a binding contract by acceptance. 420 F.3d at 1376. The offer to sell issue was discussed with appellant’s counsel during oral argument and can be heard here: [Listen]. The entire oral argument can be heard here: [Listen]. The court’s opinion is available here: [Read]. Given the prevalence of this language (as well as the language “each of the plurality . . .”) in computer system claims, I think it will be a frequent point of contention in the future — particularly during patent litigation. determining whether one or more of the plurality of uops belong to a branch path that is dependent on the mispredicted branch based on their assigned IDs. The Appellants argue that “the cited claim language as a whole explicitly requires that a separate ID is assigned ‘to each of a plurality of micro-operations (uops)’ (emphasis added).” (Reply Br. 2.) “[T]he PTO gives claims their ‘broadest reasonable interpretation. '” In re Bigio, 381 F.3d 1320, 1324 (Fed. Cir. 2004) (quoting In re Hyatt, 211 F.3d 1367, 1372 (Fed. Cir. 2000)). “Moreover, limitations are not to be read into the claims from the specification.” In re Van Geuns, 988 F.2d 1181, 1184 (Fed. Cir. 1993) (citing In re Zletz, 893 F.2d 319, 321 (Fed. Cir. 1989)). Here, claim 1 does not require that the ID assigned to each microoperation be “separate.” i.e., unique. We refuse to read such a requirement into the representative claim. Assigning the same ID to each microoperation in one of the reference’s instruction streams is enough to anticipate the disputed limitations. Based on the aforementioned facts and analysis, therefore, we conclude that the Examiner did not err in finding that Sharangpani assigns an ID to each of a plurality of micro-operations as required by representative claim 1. For other issues that arise from use of the word “each,” see these previous posts: [Link] and [Link]. Oral Argument — Golden Hour Data Systems, Inc. v. EMSCHARTS, Inc. et al. Last week, the Federal Circuit issued its opinion in Golden Hour Data Systems, Inc. v. EMSCHARTS, Inc. et al., 2009-1306 (Fed. Cir. Aug. 9, 2010). The main issue in the case concerned alleged inequitable conduct by the patent agent who prosecuted the application. Judge Ward of the Eastern District of Texas had ruled in the district court case that the patent was unenforceable due to inequitable conduct by the patent agent. Essentially, the arguments on appeal centered on whether the patent agent had “intent to deceive the patent office.” As I understand it, the patent agent, prosecuting the application in 1998, had been given a brochure by the inventor shortly after the filing of the application. The brochure was undated. The patent agent had a practice of not submitting undated material to the patent office because it would not be considered by the examiners. So, the patent agent summarized the brochure and submitted the summary via an IDS. The summary, however, did not disclose information from the middle of the short brochure that Judge Ward found material. The defendants’ attorney argued that because Judge Ward had found that even a cursory review of the brochure would have made someone aware of the material information that this amounted to “selective disclosure” by the patent agent rather than non-disclosure. 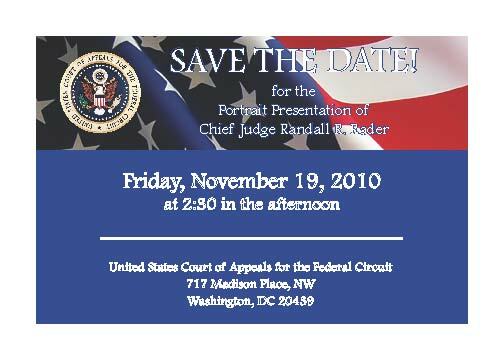 The defendants also argued that it was inconsistent to say that you couldn’t submit the entire brochure as being undated and to say that you weren’t aware of the material information; because, even a cursory review to check for the date allegedly would have made one aware of the material information. The Federal Circuit seemed to feel that Judge Ward danced around the intent issue. So, they remanded the case back to Judge Ward. This oral argument is pretty interesting if you are a prosecutor. It highlights just how easy it is to get run over by the inequitable conduct bus ten years after you’ve filed an IDS and no longer have the necessary recollection of the facts to be able to defend yourself. Here are some of the more interesting portions of the oral argument: [Listen], [Listen], [Listen], [Listen], and [Listen]. You can read the Federal Circuit opinion here: [Read]. Federal Circuit nominee Judge Kathleen O’Malley was affirmed by the Federal Circuit last week. To be clear, she has not yet been “confirmed” by the Senate; but, her district court judgment was “affirmed” by Judges Bryson, Gajarsa, and Prost in Baran v. Medical Device Technologies, Inc. et al., 2010-1058 (Fed. Cir. Aug. 12, 2010). Judge Linn noted during his presentation at the AIPLA CLE in Denver that when the Federal Circuit sits in Atlanta this November, they will be sitting at: Georgia State University College of Law, Emory University School of Law, Atlanta’s John Marshall Law School, and the U.S. District Court in Atlanta. You are currently browsing the 717 Madison Place blog archives for August, 2010.